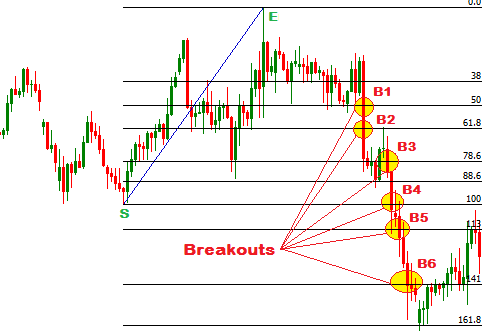 In my previous post, I explained the basic of trading forex with Fibonacci retracement tool.This post is aimed to explain the breakouts trading with Fibonacci retracement tool. I personally like range trading with Fibonacci retracement tool, but every traders need to have the knowledge of breakouts trading with Fibonacci retracement to increase the effectiveness of their trading strategy. We already know that when a Fibonacci retracement tool is drawn starting from a low to a high, the Fibonacci retracement levels represent the support levels. On the other hand, when a Fibonacci retracement tool is drawn starting from a high to a low, the Fibonacci retracement levels represent the resistance levels. In the above image, a Fibonacci retracement tool is drawn starting from a low to a high. So the 38%, 50% and 61% retracement levels represent support levels. Breakouts trading suggests a sell order when these levels are broken by the price. In the image above, a Fibonacci retracement tool is drawn starting from a high to a low. The support levels are represented by 38%, 50%, 61% and other retracement levels. 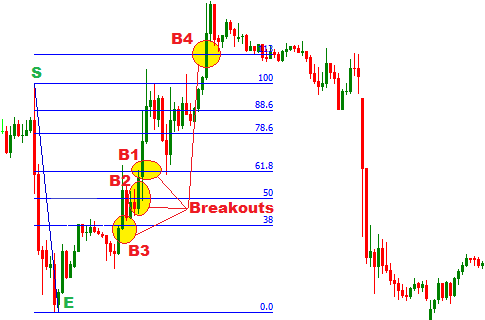 A buy order is suggested for the breakouts traders when the price breaks the important Fibonacci levels. Should I place an order when price breaks a Fibonacci retracement level? The simple answer of this question is no, you should not. Before placing an order, you have to measure the reliability of the breakouts. The bigger the difference between the starting and end point of a Fibonacci retracement tool the higher the reliability of the breakouts. Generally, the 38% and 61% retracement levels breakouts are more effective entry levels as the market can be retraced back from 61%,86% or 100% retracement levels. Any breakouts can be considered as reliable depending on the fundamental analysis and sentiment analysis. In bottom line, I will say that an extended study on the Fibonacci retracement levels breakouts should be conducted by a trader before applying it in real trading account. In my next posts, I will write about the specialty of the breakouts of every Fibonacci retracement levels. If you have any question, you can drop it in below.